Read the adventurous story of the creation and building of the world's first museum dedicated solely to one book-the Bible. Drawing on detailed firsthand accounts, Lifting Up the Bible brings the Museum's creation to life, retelling the full background of the Museum, including the colorful stories of the Museum's characters, concept, collection, and construction. It may be hard to believe an old refrigeration warehouse built in 1923 could be transformed into a museum, let alone one that includes such priceless artifacts, amazing displays, incredible architecture, and state of the art technology. The mueseum began as a simple idea in the minds of a handful of people. Soon it was reaching out and capturing others-bringing more and more partners to the table. There was brainstorming followed by sketches. Innovation followed by clarification. Focus followed by concrete plans. And, finally, the moment to go for it. To take that first giant, collective step, trusting that everything would fall into place. The museum is for every single person who desires to learn more about the amazing document that is the Bible. 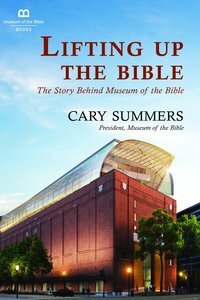 About "Lifting Up the Bible: The Story Behind Museum of the Bible"
Cary Summers serves as president of Museum of the Bible, formerly its chief operating officer, and has led a team of architects, design firms, and other contractors to build the 430,000-square-foot museum. Summers has served in executive leadership positions with Herschend Family Entertainment/Silver Dollar City Corp., one of the world's largest theme attraction operators, Bass Pro Shops, and Abercrombie & Fitch. He founded Treasures of the Holy Land, an e-commerce enterprise that imports handcrafted goods made in Israel, and serves as CEO of Nazareth Village in Israel, a re-creation of the first-century village where Jesus grew up.